The versions it wanted to install was the same version (or slightly higher) of 5.2 so I thought nothing of it and agreed to let the system update. It went through the install smoothly, but never rebooted. Eventually I was able to navigate back to the web browser and it told me I now had 5.2 firmware, but 6.1-15152 DSM. I am still unclear how this install happened, but I assume that it downloaded it automatically from the internet even though I had enabled the "only install security patches" option. As I posted in the Tutorial forum a few posts after the linked one, I was able to get Jun's loader installed and boot into 6.1-15152 and I thought all was well. However, when I booted into the DSM, I was in a world of hurt. I have one bad disk in the array clearly that lists bad sectors, but that's the point of the SHR array right? Well I let the RAID start to repair itself and always around 1.5% into the repair it crashes and tells me the System Volume has crashed. However, when this happens Disk 1 (AFAIK, perfectly fine drive) switched into Initialized, Normal but drops out of the RAID array and then it goes into crash mode. 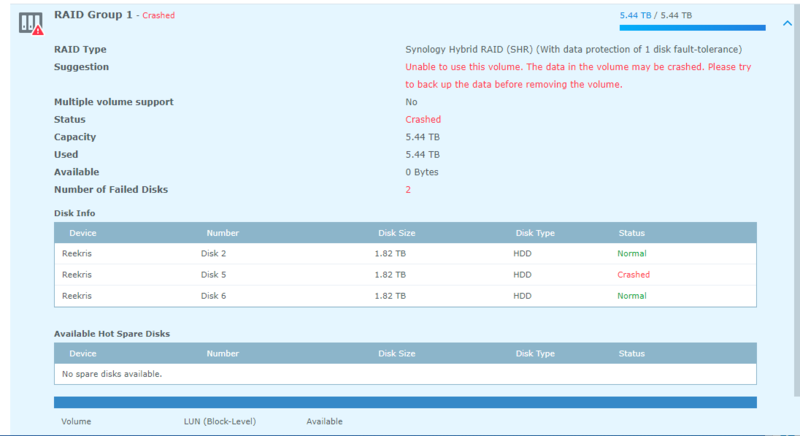 I don't understand the relationship between Disk 5 crashing out when repairing the RAID and Disk 1 disappearing. It stands to reason that if Disk 1 is fine, which is seems to be that it would just fail and stay in degraded mode until I can swap in a new drive. I have tried starting the system with Disk 5 unplugged, but that does no good. I have also begun playing around with attempts at data recovery in a LiveUSB of Ububntu using some of Synology's guides as well as just googling around. So I suppose I have a few questions. 1. Does anyone know of a relationship between possibly installing the new system, and the bad disk causing the good disk to crash? 2. How likely is it that Disk 1 (AFAIK good disk) is also toast. 3. Do you have any tips for recovering data from a situation like this? I would greatly appreciate any help or advice you can provide. I have been banging my head against a wall for 3 nights working on this. I have all the really important stuff backed up to the cloud so it is not a matter of life and death (5 year, 10000 photos) but there is a lot of other media that I am willing to do a lot to not replace or only replace some of. I suspect that by a bad combination of events (mismatched XPE loader/DSM update) and a bad drive, your volume may be badly damaged, beyond recovery. The bad upgrade might have left the DSM partitions out of sync in addition to the change of architecture (SHR/Volumes to RAID Groups/Volumes) from 5.2>6.1, hence Disk 1 status, Disk 3 looks like a genuine failure, maybe brought about by the raid migration/conversion process hitting the disk hard. If you now have a correctly booting XPE6.1/DSM.6.1 system, I would boot with all 4 drives attached, DSM/SHR might allow read only of your volume in File Station, or via SSH. @IG-88 is right to try and raw copy your data first, the more you play around the more the chance of causing more damage. Would I need a single external drive that is larger than the raid array? It seems like it could be copied to an external (all I have handy) and then possible re-mounted in an array via Ubuntu for copying. And it starts Parity Checking, and then of course fails. This gives me a little hope that maybe Disk 1 could somehow be able to be mounted. For now I am just running a straight copy onto some hard drives in order to save as much data as I can and if no more possible solutions pop up I will just RMA the drive (still in warranty) and remake the partition with the other 3 and add the 4th when WD sends me a new one.